There are so many things you want in your life and in many case your desire is not fulfilled in time as you miss to keep track of those. ITunes brings an app for you, which will keep track of your most wanted items in life, may it be a music player or a car. Keeping track of things will be easy with the app and when you set goal for something, it becomes easy to achieve. This is an app called Musthaver which keeps your dreams arranged in proper form and lets you track things properly. Musthaver, presented by Vadim Rokhlin is a free app in the store which can be downloaded on iPad, iPhone and iPod touch. This is a social product tool that can be used to explore items you have had and items you want to have. You can follow people’s opinion or share your opinion about the item. Create the item when you have it and let your friends know about the same. Here, you get a chance to share the items with your friends and even with those you don’t really know. You can check what your friends want to have and can surprise them with such an item as a gift on a special occasion. There is a point system in the app where you accumulate point for your action. You can recommend products with those points and create an influence on your friends. Musthaver is a free app for iTunes users which is compatible to iOS 7.0 or later. Musthaver lets you set your goal for the products that you consider you must have in your life. This is a social product tool through which you can share your choice and preference with the world. It can be shared with your friends as well as people you don’t know. You can create an item and describe it in your own way. This way you can influence people about a product. The app will let you get advanced information about products that your friends have added because they will also describe the item that they have. You can not only create products that you want to have, you can also provide the count for those items that you had, once upon a time, have now and want to have. You can create a collection of products you like. 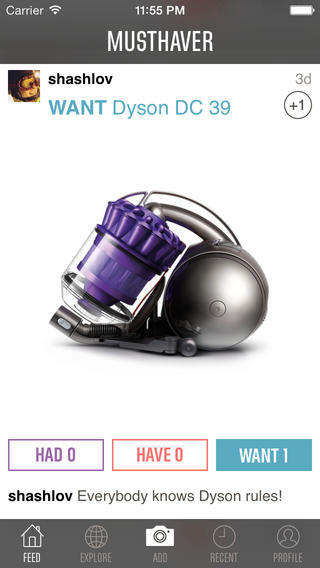 You can add photos of the item and also create reviews and tips for other users. 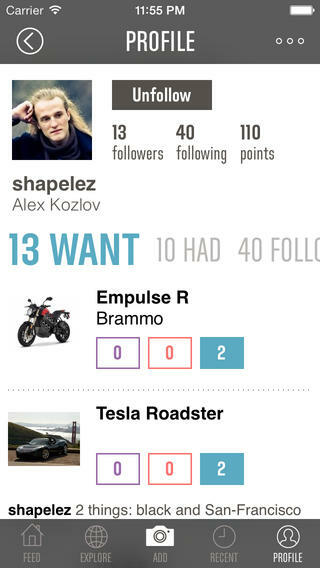 Musthaver actions will score points for you and you can recommend things to the other users. The version 1.1 of the app takes around 2.2 mb space on your device. Having an idea about the product will help you make the buying decision. Summary: Musthaver provides you a platform where you can share your interest about products that you want to buy and products that you have, with details. Good: It is possible to compare products in the same category and the reviews are real, so buying decision becomes simple. Bad: The interface could have been a little interesting and colorful.